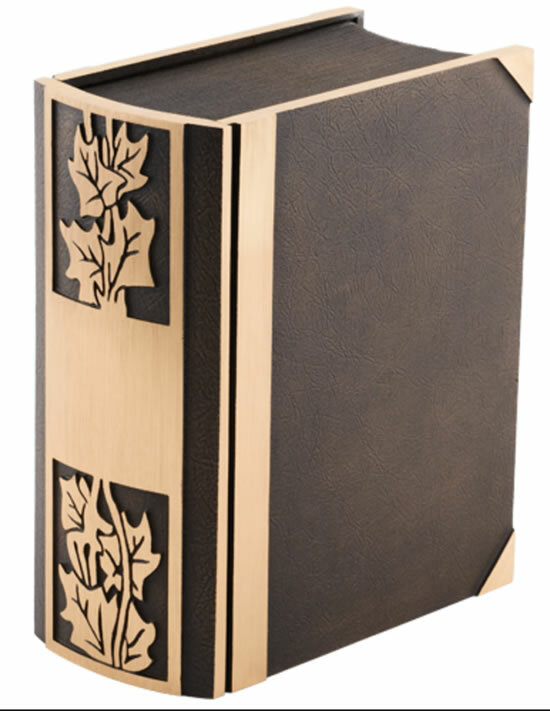 Highly stylized cast bronze urn with an elegant book design and ivy motif on the spine. Cremains are easily loaded by removing the screws that attach the spine. This is a professionally crafted, museum quality work of art. Crafted using the lost wax process. As with any urn it is important to keep the cremains in a sealed plastic bag inside the urn. This style is also available as a companion urn (see under the Companion Urns category). Engraving area for the individual Urn is 2" x 2" - Just enough space for name and dates, and a very short sentiment. These books are made in small batches at a time and are not always in stock. Please call for availability if you need the urn in a timely manner. If not in stock, urn may not ship for 4-6 weeks.